Being that it's Tuesday, and Thanksgiving is now safely behind us all (well, okay, maybe not Tiger Woods), I hope all the food has officially been digested and any lingering stomach pains and/or headaches (family-induced or otherwise) have long since dissipated. If not, then definitely don't read today's post. Just a warning, as I tend to be wordy and kind of annoying. Though I have to admit, reading my thoughts on a computer screen are less headache-inducing than listening to them in person. Yes, well. Where were we? Um..lessee...bad Tiger Woods joke...and, um...right! Thanksgiving weekend reading. There wasn't much of it, sadly, but still I think what I did manage to read was well worth the time and effort. As I was rifling through my shelves in search of my next foray back to the comics that got me to love this hobby, I came across a dog-eared issue of The Comics Journal. Which is significant, because I only own two issues of that oh-so-high-and-mighty comics culture magazine. And I bought each issue because of the feature interview, and not because of any of the comics coverage the magazine provides. Not that I have anything against The Journal--I think they love comics as much as (or, probably more accurately, more than) anyone in and around the industry. It's just that I'm not too big on most of the books they cover. And I don't like the tone of the letters column and the overall scorn for mainstream superhero books provided by the magazine. That said, the two issues I own feature interviews with two of the mainstream's biggest stars--Darwyn Cooke and Brian Michael Bendis. I happened to come across my February/March, 2005 issue (No. 266), which includes a lengthy interview with Brian Bendis at the tippity-top of his game. The interview was conducted in December, 2004, and at the time Bendis had just killed Hawkeye and launched the mega-hit New Avengers at Marvel, and was riding high as the go-to guy at the company. Obviously, Bendis has seen continued success at Marvel, as he remains the driving creative force at the publisher today. I remember when and where I was when I bought this issue of The Journal, and I know that sounds a little weird. But let me explain. It was (clearly) early in 2005, and I was spending my Tuesday nights in Greenwich Village, attending some post-graduate classes at NYU. They were writing classes--specifically comics and graphic novel writing classes. And, man, did I love those classes. And not just the classes--the atmosphere. As I've mentioned many times before, I started my college career at a small school where I played baseball. When I was injured, I transferred to NYU, and I spent two years (and an extra semester because very few of my credits transferred along with me) there, finishing my degree. I loved NYU, and I loved being in the Village. When I graduated, I decided to try the workforce. When that proved to be stupid and useless, I decided to go back to school, as quickly as possible. And when the big, purple NYU Continuing Studies book arrived in the mailbox one day, and there was a class called "Writing for Comics and Graphic Novels"...well, let's just say that was the easiest (and best) money I ever spent. The first of two classes I attended was taught by former Marvel editor and writer, Danny Fingeroth. Danny's a great guy, and he's one of two people whom I credit with giving me enough confidence to eventually share the stories I was writing, and in many ways, to become an editor myself. The second person was Denny O'Neil, but we'll get to him in a little bit. Danny Fingeroth's class at NYU always filled up fast, and I was one of the last students to sign on before the class was topped off. It was held in one of the buildings I used to haunt as an undergrad, right on the main NYU campus, and it met every Tuesday night for three or four hours. That class was special, and it meant quite a bit to me. Since it was downtown, and I don't like public transportation (claustrophobia is my super weakness), I'd drive into the city at around 3:00 to avoid (ha!) traffic, and usually I'd have a couple of hours to kill before class started. Typically, I'd spend them either reading, writing, or visiting the three comics shops within walking distance of NYU--Forbidden Planet on 13th off Broadway, St. Mark's Comics on...um...St. Mark's, and the now-closed Village Comics on Sullivan. 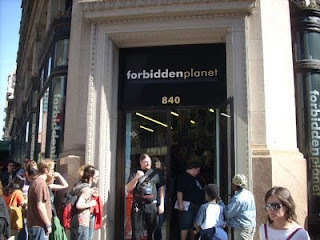 Of the three, I preferred Forbidden Planet, mostly because of the constantly buzzing atmosphere of the place. Even late in the afternoon on Tuesdays, that store would always be filled with people. When I was an undergrad, I'd head over to the shop on Wednesday mornings, and man, that was a scene. A very cool place to be for comics people, that's for sure. They have this huge wall of new books, and on Wednesdays, there's just a line of people browsing, reading, and talking comics. It was in that shop that I came to realize that comics were something more than the five or six dudes that showed up at my then-LCS, bought books without talking to anyone, and left. Particularly at Forbidden Planet, where the store itself reminded me more of a Disney World attraction (in a good way) than a comics shop, I started to think about comics in a much different light. And that's not meant as a knock towards my first LCS where I bought my books each week after college. That store played a huge role in my growing passion for comics, and it'll always have a place in my heart. But I bought my first comics at Forbidden Planet, and for that reason alone, I consider that store to be the site of my very own origin story. And I'm telling you--it's a great scene at that place. There were grown men and women in the store, some in suits and ties, taking their lunch break. There were NYU students and high school kids and children with their mom, all looking around the racks on a Tuesday evening. There were guys dressed all in black, hoodies pulled up over their heads and women in business clothes and a guy with a stained Superman t-shirt. There were (and, I'm sure, still are) sections of the bookshelves in the store devoted to Alan Moore and R. Crumb and Neil Gaiman and Warren Ellis and Jamie and Gilbert Hernandez and Frank Miller and Brian Bendis. There were Bat-symbol t-shirts and Green Lantern rings and the smallest little indy books you've ever seen. And all of it--all of it--was under one roof. And it was at Forbidden Planet on a late Winter's afternoon that I picked up the Brian Bendis issue of The Comics Journal, paid for it at the counter, stuck it in my bag, and walked back down Broadway to my class for the evening. I'd get to the classroom, usually, 45 minutes early, and I'd either write or read or talk to any other early students. At first, it was only me, sitting in the room for an hour or so, reading an issue of Batman or trying to finish up my latest writing assignment for Danny. But, then, after a few classes, I noticed that more and more people started showing up early. First it was Ed, then it was Mitch, then it was five other people. That class was infectious, man. Creative people, all hopelessly in love with the medium, and chomping at the bit to make it in comics. Ed was/is a screenwriter, and though I haven't talked to him in a couple of years, back then he was making his yearly income by writing and selling scripts to Hollywood. He was insanely talented, and a heck of a good guy. Mitch was just engaged the last time I talked to him, and he was actually working for Marvel in their consumer products division. But back then, he was working at a Midtown theater on Broadway, and he was writing awesome comic scripts. I was just out of school, unemployed, and really not sure what I wanted to do with my life. I liked to write--I knew that. I was becoming more and more enamored with comics, and I was starting to put two and two together. Talking with those guys made liking comics--and wanting to write them--seem not only acceptable, but downright reachable. And that was the first time I had any such inclination towards a possible career since I graduated. The class itself was kind of intimidating, at first. I was the youngest person in the class--Mitch was probably the next youngest, only a few years older than I was. These were professionals--in some capacity or another. They had their own places, their own careers, and some even had their own families. They were all at a much different place in the world than I was. Than I still am, really. They were smart. To a man, those guys were smart, and interesting, and just fun to be around. They were all dorks, sure, but you couldn't pick them out in a lineup. They didn't wear Captain America shirts, they didn't flaunt a Silent Bob coat. They came to class in shirts and ties and suit jackets. They were professionals, and they acted that way. The conversations we had before and during class were dorky, sure, but the conversations we had about process and style and tone and pacing were a school unto themselves. After a while, we started hanging out after class, at a bar directly across from the main administrative buildings on campus. It was a typical Village bar--dark and a little noisy, but a great place to hang out and unwind. We even managed to get Danny to come along a few nights, and those were always insightful and fun. The class itself was the single best thing I did in "academia." Previously, I had taken a poetry class at NYU, and the professor was amazing. She told me she liked my stuff, and she encouraged me quite a bit. I even read my stuff aloud, and was told nice things by very smart, very creative people. Encouraged, I ended up taking a creative writing class the following semester, but my short stories were never met with any positive reactions, other than a very short play I wrote. I was told that one "sounded like real people talking" by the professor. That was a huge deal for me, mostly because I learned everything I knew about writing dialogue from studying people, and from reading Brian Bendis comics, and combing through interviews with Bendis. Which brings me back, momentarily, to The Comics Journal issue that I read this weekend. 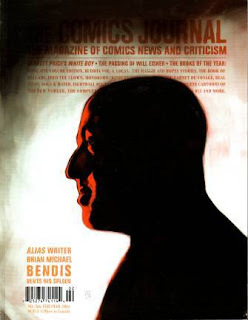 In it, Bendis talks about his own process, and how he has "dedicated his life" to studying the way people talk. To try and break the code of people's conversational patterns and to train his hand to write exactly what the ear hears. Many times, comics will be written with a stilted, pseudo-real dialogue style. When you read those books aloud, they just don't sound like the way people talk. Comics can mimic language, but they cannot reproduce it. Fine, but try reading a Bendis book out loud. I have. It sounds like the way we talk. To say that Bendis is my biggest inspiration as a writer is an understatement, and it's in no small part due to that issue of The Journal. The article was an insightful and fascinating look into the mind of someone who has made it, and has done it his way and made the industry conform to his style, his ear, his voice. But, as I was reading the interview (probably for the tenth time since I purchased the magazine) on Thanksgiving morning, I found myself thinking about Ed, and Mitch, and Danny Fingeroth. I even went back through old computer files and looked at some of the stuff I was writing at that time. Some of it's good, some isn't. But there's just so much of it. That class was a breeding ground for creativity, and after working for over three years in a place that was so utterly devoid of an original thought, let alone creative sparks, I couldn't believe how prolific I was just five years ago. The time stamps proved this. A full story written on February 12. Another full story written the following day. Parts one and two of the Spider-Man three-parter that I was writing for Danny Fingeroth. That sounds cool, reading that last bit back. Each week in the class, three students were to present their latest work and have it read aloud to be critiqued by the rest of the class. That class was filled with honest people, let me tell you. One guy presented his comic, sat silently for twenty five minutes of harsh criticism, and never came back. I was nervous to present, but when I did, things went exceedingly well. I was told I should write Spider-Man for a living. Not since my playing days had I felt such a rush of adrenaline. Later, Denny O'Neil, the writer of some of the most influential Batman books ever written, told me that the Batman story I wrote for him was "way above average." I was floored. I still have the typed-out letter he sent to me in the mail to tell me he liked the story. You ask me what my most prized comics possession is, and I'll tell you it's a Goon page. But if I was an honest man, I'd tell you it was that letter from Denny O'Neil. So, anyway, reading that particular issue of The Comics Journal made all of those times, and those people, flood back to me. Comics have a wonderful habit of doing that--bringing back nostalgic emotions. This, obviously, was not a comic book. It was an interview--and a darn good one that I feel anyone with even a passing interest in the craft of the medium should hunt down and read--but it accomplished the same thing. I think about some of the guys in that class, and I wonder what they're up to today. I think about the electricity in that writer's room. I know it was just a silly post-grad class. And I know I was paying to be there. But those guys wanted in, so badly, that they changed my perception of things. They made me feel like I could write for a living. They made me feel like I could write comics for a living. When I look back at it now, it's with a tinge of sadness because of the way these past few months have gone. I honestly don't know what I'm going to do next, or if I'll even pursue comics as a creator or even just as a fan. But history doesn't, and I can't tell you how nice it was to think about my old Tuesday afternoons at Forbidden Planet, my old Tuesday evenings in the cramped college classroom around that big square table with those great, creative people, my old Tuesday nights at a bar with friends, talking about comics and the future. And our futures in comics. I wonder how hard it is to break into either of the big two (of Marvel and DC) in a mainstream book -- they just seem to coast from one "big event" to the next, without really leaving much leeway for a new writer's storylines... of course, that's just my impression. Well, if you're not published, it's pretty much impossible. Neither company takes writing submissions anymore, and like you said they have things already mapped out for a good, long time. The best way to get noticed by the big boys is to self-publish, either on the Web or in print. Unfortunately for me, my two attempts at this have stalled for the time being. I should actually have a completed issue of my own comic done by this time next week, but plans with the publisher fell through. I might publish it myself, but I really want to make sure I'm proceeding in the right way before I do antyhing. I've been burned a lot this year, so I want to proceed with the utmost caution.